This article is about the film. For the 1986 computer game, see Hollywood or Bust (game). For the TV series, see Hollywood or Bust (TV series). Hollywood or Bust is a 1956 American semi-musical comedy film starring the team of Dean Martin and Jerry Lewis. 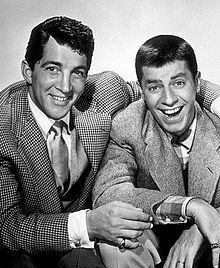 The picture was filmed from April 16 to June 19, 1956 and released on December 6, 1956 by Paramount Pictures, almost five months after the Martin and Lewis partnership split up. Malcolm Smith (Jerry Lewis) wins a brand new automobile at a raffle. Steve Wiley (Dean Martin), a gambler from New York, obtains a counterfeit of the winning ticket and also claims that the car is his. The raffle's manager declares them both winners and that they can split the car any way that they want. Steve wants to sell the car, but Malcolm wants to drive it to Hollywood to meet actress Anita Ekberg. Steve claims to know her and agrees to drive to Hollywood with Malcolm, secretly planning to steal the car. Malcolm brings along his dog, a huge Great Dane named Mr. Bascomb who foils Steve in his many attempts to make off with the car. Along the way they pick up Terry (Pat Crowley), an aspiring dancer, who has a job waiting for her in Las Vegas. Once there, Malcolm gets his "lucky feeling" and wins $10,000 ($92,200 today) at a casino. In addition, the woman of his dreams, Anita Ekberg, is also at the hotel and Malcolm finally gets to meet her, with hilarious results. Steve begins to show a change of heart. He not only agrees to go along with Malcolm to Hollywood without stealing the car, but he also proposes to Terry. Malcolm spoils the mood by telling them that he no longer has any of his casino winnings, having used it on a gift for Anita. Steve decides to retrieve the gift and they head to Paramount Pictures to locate her. After some back-lot adventures, they find Anita, who agrees to return the gift in exchange for the services of Mr. Bascomb in her next movie. This was the last film that Jerry Lewis and Dean Martin appeared in together. According to Lewis in his autobiography Dean and Me, he and Martin did not speak to each other off camera during the entire film shoot. In addition, Lewis claimed that this was the only one of his films that he had never seen, citing it as too painful to watch. The service station scenes were filmed on Live Oak Street in Thousand Oaks, California. The film was included on a five-film DVD set, the Dean Martin and Jerry Lewis Collection: Volume Two, released on June 5, 2007. In Paramount's 1972 film The Godfather, a scene of the Las Vegas strip, including a shot of the Sands Hotel marquee showing an appearance by Martin and Lewis, was taken from this film. In Paramount's 1978 film Grease, during the drive-in theater scene, a clip of the theatrical trailer for the film is shown, as projected on the drive-in's screen. The 1988 film Rain Man replicates much of the story. Two brothers, one sharp and crooked (Tom Cruise) and the older other brother mentally handicapped (Dustin Hoffman), drive with a girl across the USA to Los Angeles. In Las Vegas, the handicapped brother proves able to win thousands. ^ Bidwell, Carol A. (1989). The Conejo Valley: Old and New Frontiers. Windsor Publications. Page 112. ISBN 9780897812993. ^ Pomerance, Murray, ed. (1 November 2002). Enfant Terrible! : Jerry Lewis in American Film. NYU Press. pp. 75–80. ISBN 9780814768341. This page was last edited on 22 January 2019, at 20:31 (UTC).